The federal government is preparing to take steps to mitigate the impacts on the North American steel industry of a surge in cheap foreign steel from countries other than the U.S. There are fears that dumping of cheap steel into Canada will only increase when Canadian retaliatory tariffs take affect against American steel and aluminum July 1. Quotas and tariffs are also reportedly being considered along with other measures previously announced by the Liberal government to prevent cheap foreign steel from finding its way into Canada or from being shipped through Canada into the U.S. market. "We understand there is a lot of pressure from the steel mills to provide relief. We are not unsympathetic to that...but we would like the government to really understand that for every job that might be safeguarded in the primary steel industry, there's 10 to 100 jobs downstream that could get side-swiped," said Walter Koppelaar, CEO of the construction steel fabricator Walter Group, in an interview with host Vassy Kapelos on CBC News Network's Power & Politics Thursday. Koppelaar, whose steel fabricating company employs 700 people, said the offshore steel that is flowing into Canada is taking the place of steel that is no longer flowing into Canada from the U.S.
"We need to get it somewhere. In our industry, in long product, wide-flange beams, which is what is primarily used to frame buildings, none of it is produced in this country. The last thing we need is more sort of protective measures because it just drives up prices. It reduces the options for us to source globally," said Koppelaar. 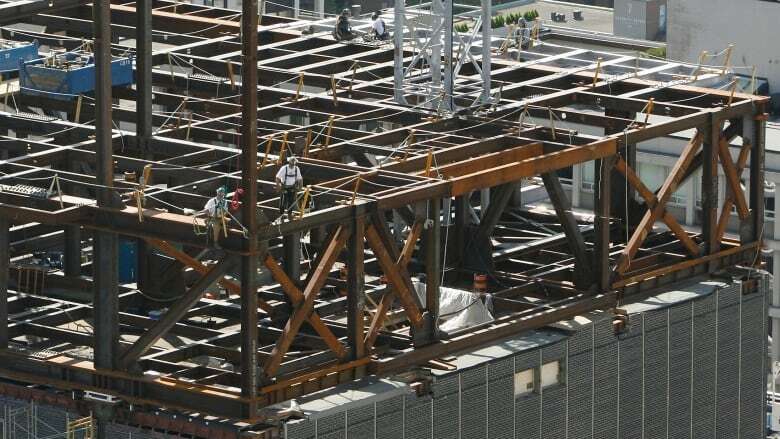 Richard Lyall, President of the Residential Construction Council of Ontario, said he's aware that the government of Canada has to respond to actions taken by the U.S., but urged against measures that could put housing affordability at risk. "We're seeing price increases to come, based on the uncertainty because people will build in contingencies into their contracts just in case something goes wrong," said Lyall. The industry is very concerned that some projects might get cancelled and others just won't proceed, said Lyall. "We use thousands of tons of steel in high rise buildings and we're talking about thousands of dollars per unit depending on the building," said Lyall. "We're urging the government to really thoroughly consider all of the elements of the situation and not respond in such a way that we shoot ourselves in the foot." International Trade Minister Francoise-Philippe Champagne said the government is listening to the concerns of the Canadian steel construction industry, "but our priority is obviously to protect the integrity of our market, to defend the industry and our workers." At a press conference announcing the final list of retaliatory tariffs against the U.S., Innovation Minister Navdeep Bains said the government will consult with industry about specific measures designed to safeguard the North American steel market. "We're concerned about diversion and we are going to work very closely with the sectors, both aluminum and steel, to look at the specific products that we need to put safeguards around. This is a commitment that we have made and we'll continue to work with them to implement them in a timely manner," said Bains. The Canadian Steel Producers Association, which represents the country's major steel producers, said the intent of the safeguards is not to cause price shocks or commodity shortages, but to stabilize a market that is being unduly affected by significant increases caused by foreign steel diverted to Canada because of the American tariffs. "I hear the concerns that they are expressing, but I think it's important to keep in mind that we're not talking about something that is necessarily the basis for a block in international supply or any kind of an undue limitation on where they can source from. You're talking about an evidence driven vehicle to ensure that trade in Canada is fair," said association president Joseph Galimberti. "If they are importing steel from offshore on a fair basis that does not negatively impact the Canadian economy, then the safeguard is not something that they have to necessarily worry about," said Galimberti.